Don’t make it hard! I’ve seen people go thru so many steps to get their pictures to show up in their blog. They think that now, with Google+, the way they used to do it with Picasa Web Albums is all gone. No! It’s easy. 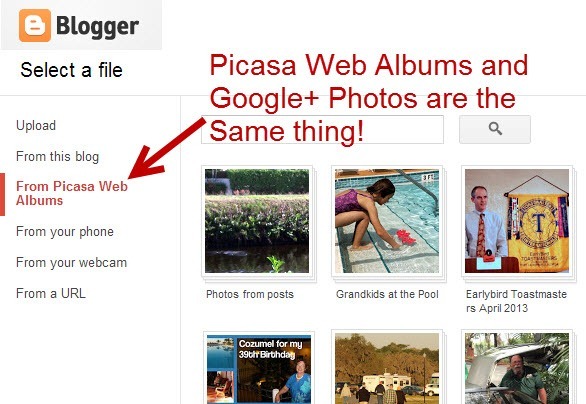 Google+ is the same thing as Picasa Web Albums. I take pictures all the time and import them to my computer. Using Picasa, I make them look better with a few clicks. I upload the pictures that I feel are the best, or at least the most representative of my life at any given time. I have joined Google+, so the button in my Picasa that used to read “Upload” now reads “Share with Google+” I share with the public. Using Blogger I start a new blog post and, when I want to insert a picture, I use the Add Image button and then select the option for “From Picasa Web Albums.” Remember, Picasa Web Albums and Google+ Photos are the SAME THING. Yes, it would be nice if Google could be more consistent with their language. They’re calling it Google+ everywhere else, but they still call it Picasa Web Albums on this window in Blogger. Want to Watch the Tutorial Video? If you are a member of Geeks on Tour, we have a whole series of tutorial videos on using Blogger. Here’s the video that shows how to insert pictures from the web. If you’re not a member, you can sign up here. Published by MrsGeek, in Blog. Tagged with Blogger, Blogger Tutorial Videos, Google Plus.